According to the team captains, seniors Gabby Breuer and Emily Supron, the future looks bright for varsity swimming. 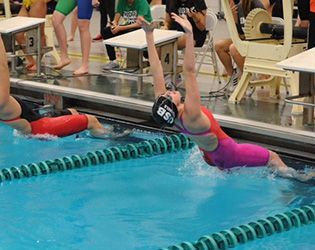 The girls noted that several swimmers graduated last spring, and the team wasn’t sure it would have the numbers to be competitive this winter. "We were scared the team would be small, but the underclassmen really came through—we had nine sophomores and nine freshmen," Breuer offers. "Everyone immediately became friends, and the team clicked from the beginning of the season. It was a lot of fun, and everyone improved to an amazing degree." Standout achievements from the young lineup include freshman Caroline Grant, who dropped 25 seconds off her time in the 500 freestyle over the course of the season. "That’s huge," Breuer explains. Another freshman, Rebecca Michaels, swam her best time ever in the Prep B finals, finishing fourth in 100-meter backstroke and missing third by only 0.00.22 seconds. Michaels was also named Skyland Conference Raritan Division All-Conference second team, a remarkable achievement for a freshman competitor. When asked about the team’s dynamic this season, both Breuer and Supron point to the leadership of the team’s new head coach, Nolan Silbernagel. "He helped all of us—really breaking things down and teaching us how we could improve," they offer. "It definitely helped unify us as a team and made us look forward to competitions." The captains are the only two seniors on the team this year, and although they will be missed when they graduate, they are confident that rising seniors Preston Reep and Sabrina Sukhin will lead the team next season and that the returning underclassmen will make increasingly significant contributions.